Lenexa is a growing city in Johnson County, Kansas, covering a total of 32 square miles. Approximately 52,000 people call Lenexa home, bordered by Shawnee, Overland Park, Olathe and De Soto. At least one widely recognizable historical figure has roots in Lenexa. James Butler Hickok, better known as Wild Bill Hickok, settled on 160 acres at what is now 83rd and Clare Road. He then made a name as a scout and sharpshooting gunslinger for the Free-State Army (the Jayhawkers) in the mid 1800s. A railroad engineer, Octave Chanute, platted the townsite in 1869 and named it Lenexa. The name itself is derived from the Shawnee name of Chief Blackhoof's widow, Na-Nex-Se. Major industries have bustling hubs in Lenexa, including Quest Diagnostics, United Parcel Service, JCPenney and T-Mobile, where many locals are employed. Oak Park Mall provides outstanding shopping, and local city festivals like the Great Lenexa Barbeque Battle every June, and the Spinach Festival every September, provide wholesome hometown entertainment. New Concept Auto Service is proud to provide Lenexa with reliable auto repairs and customer service. We are diagnostic experts and have been AAA approved for 30 years. We back all our repairs with a three-year, 36,000-mile warranty, so you can count on professional service and repairs with each visit. 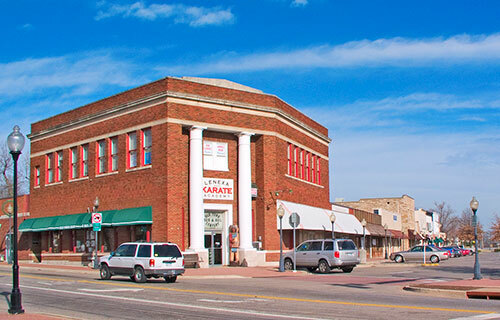 We are conveniently located just two miles east of Lenexa in Overland Park along 87th Street.